This villa is located in blissful open area in the forest close to Orliac (5 km). The private terrain (7 ha) offers complete seclusion and for the kids plentiful of joyful playing fun. The high veranda, the private pool and the playground for children, this house is equipped with all amenities. Even inside the house you will not be lacking for anything. Get comfortable by the wood burning stove in the cozy living room. 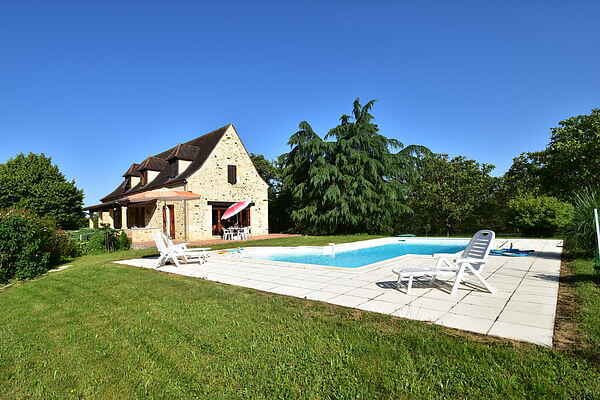 This house is ideally situated for a visit to Belves and Villefranche-du-Perigord (14 km). These beautiful old villages have lots to offer. Belves is built on a rock, guaranteeing great views. As well as in Villefranche-du-Perigord there is great shopping and lovely walks passing by beautiful monuments. In Prats-du-Perigord (4 km) you can have a plunge in the little lake and in Siorac-en-Perigord (17 km) you can rent canoes to go discover the Dordogne River. You want more adventure? The caves of Les Eyzies-de-Tayac-Sireuil (34 km) await your visit. Domme (25 km) is another place where you can go on a subterranean exploration. Afterwards you stroll through this wonderful village, before taking a seat on the terrace.